Note: Not sold to individual consumers without an order from a speech-language pathologist. Simple, easy-to-use DAF device for treating childhood stuttering. For sale only to speech-language pathologists, schools, other institutions, and parents of children who stutter with a letter from the child’s speech-language pathologist. Not sold to individual consumers without an order from a speech-language pathologist. The School DAF provides one type of altered auditory feedback (AAF). Delayed auditory feedback (DAF) immediately reduces stuttering about 70% at normal speaking rates without training, mental effort, or abnormal-sounding or abnormally slow speech. The device trains 55% carryover fluency (after removing the device), without speech therapy. 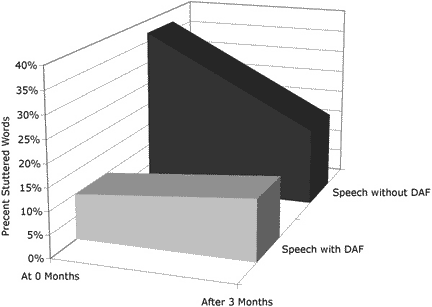 With speech therapy, DAF can induce a slower speaking rate with stretched vowels to make even severe stutterers nearly 100% fluent. The Sennheiser PC131 full-size headset gives you the best sound quality and maximizes the SmallTalk’s effectiveness. By using the full-size headset on telephone calls, in speech therapy, and in stressful conversations such as public speaking, you’ll maximize carryover fluency and not need to use the device for lower-stress conversations. 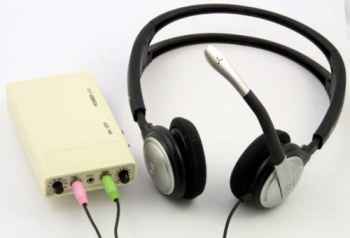 The full-size headset also allows listeners to try your SmallTalk to hear what it sounds like. Then they’ll want to talk to you about stuttering and you’ll discover that there’s no reason to be ashamed or embarrassed about your speech. The Sennheiser PC131 headset has a noise-canceling microphone to eliminate noise at the source. Electronic circuits filter high-frequency noise above your vocal range. DAF range 30 milliseconds to 200 milliseconds. User-adjustable. Binaural (two ear) or monaural (one ear) sound. Binaural sound is 25% more effective than monaural sound and is recommended for severe stutterers; mild stutterers may be able to use monaural sound. 35-7500 Hz frequency range clearly reproduces all vocal frequencies of adults and children. 9-volt battery last about 30 hours. AC adapter (included) doesn’t charge the battery. Beige case, with belt clip. Two 3.5mm jacks for any standard microphone and headphones. One 2.5mm jack for any standard cellphone earset. 4.5" x 2.7" x 0.9" (11.5 cm x 7 cm x 2 cm); about the size of an iPod. Alcohol prep pads for cleaning the microphone between children. Also to prevent the spread of diseases we have optional washable headphone covers. AC adapter (doesn’t charge battery). Tell us if you need 220-volt European, British, or Australian plugs. I purchased a DAF while attending the ASHA convention. It is amazing how much delight my students with fluency issues gained from using the device. In addition to supporting their reduction of dysfluencies, I observed an expansion of sentence length and an increased quantity of utterances. They enjoyed listening to themselves! Thank you for producing a quality item at a reasonable price. I am writing to say "thank you" for the contributions you and your company have made to the treatment of stuttering. The web site is a generous offering of information given to the public and professionals at no charge. Several years ago, I ordered a Delayed Auditory Feedback machine from your company and saw wonderful results for my students. I used the device to establish fluency and then introduced fluency shaping techniques. I have three elementary students who have "graduated" from the speech therapy program because they no longer stutter! I whole heartedly endorse your products. When Jonathan came home on Friday I had him put on the DAF and tell me about his day. IT WAS AMAZING! He did not stutter at all. I have to tell you, I broke down and cried. It was such a joy to hear him talk and not fight to get his words out. He wore it during the evening on Friday, and all day Saturday. I think he only stuttered a total of three times in two days. He seems to be quite comfortable wearing it. It did not seem to distract him at all. We encouraged him to start speaking a little louder while he has the device on. He has become very soft-spoken with his stuttering problem. He talked to himself out loud a lot this weekend while he had the DAF on. We did not tell him to stop since he was getting use to it. I did talk to him and tell him that he cannot do this during class since it would be a distraction. You have been a big part of Jonathan's life over the past four to five years. We want you to know how much we appreciate the extra time and effort you spend with him. I thought of you often this weekend as I sat and enjoyed listening to Jonathan talk to us with such fluency. We are loving the school DAF equipment! My students are having great success with it. I must tell you in my stuttering group once a week there came a new member from Germany but I think born in India and with very bad stuttering. When he should say his name it took about three minutes with very big stretches in all his body. After a while we asked if he wanted to try a [School] DAF and with the [School] DAF he almost at once could speak [slowly] with no problem. That is what I every time find with the DAF. I am a speech therapist in the public school system. I have been using the School DAF and had two students graduated from the speech therapy program who now have fluency within normal limits. I use the device daily as an auditory trainer for articulation therapy too! I turn the delay to off and turn the volume up so that the student can self monitor. It works great. Thank you for making a great product that is making a difference in the lives of children who stutter. Completely changed my student's life! Thank you very much!! The DAF has completely changed my student's life! Over Christmas break, Jake did not want to use his headset out in public. He does not mind using it in school; in fact, the other kids think it's really cool. Without his device over the holidays he had a rough time. An adult man was actually teasing him out in public! We appreciate your help! It was good to document the difference in his fluency. I need to do this before the school will buy him his own DAF or upgrade. Van Borsel, J., Reunes, G., and Van den Bergh, N. (2003). “Delayed auditory feedback in the treatment of stuttering: clients as consumers,” International Journal of Language and Communication Disorders, 2003, Vol. 38, No. 2, 119-129. Radford, N., Tanguma, J., Gonzalez, M., Nericcio, M.A., Newman, D. (2005) “A Case Study of Mediated Learning, Delayed Auditory Feedback, and Motor Repatterning to Reduce Stuttering,” Perceptual and Motor Skills, 2005, 101, 63-71.